Advanced emerging building materials, such as structural insulated panels (SIPs), are engineered to provide more durable, energy-efficient homes and commercial buildings. Using SIPs to create a high-performance building envelope is the first step to producing “green” building that is strong, energy efficient, and cost effective. Structural insulated panels (SIPs) are a high-performance building system for residential and light commercial construction. The panels consist of an insulating foam core sandwiched between two structural facings, typically oriented strand board (OSB). Energy Efficient – 50-70% more energy efficient than stick framing and fiberglass insulation. Within the decade, it is estimated that as much as one-third of residential construction will use structural insulated panels or SIPs. These energy-efficient building panels are among the strongest, most versatile construction components available today. Michael Morley presents information about this relatively new technology for the many builders who will be using it within the near future but who know little about it. Stock SIPs are produced in thicknesses from 4-1/2 in. to 12-1/4 in. and in sizes from 4 ft. by 8 ft. up to 9 ft. by 28 ft. Their R-values range from about R-15 for a 4-1/2-in. EPS or XPS panel to higher than R-32 for a 6-1/2-in. Urethane panel. A 12-1/4-in. EPS panel is rated at R-45. Custom sizes and configurations are also available from some manufacturers, and virtually any bondable material can be applied as the facing material. The flexibility of the manufacturing process means that custom lengths and skins can be ordered for nearly any application. Many factors come into play when building a home panelized. Because they are engineered and built in a factory, panelized walls (and roof panels) are more expensive initially than buying raw materials for conventional construction. However, the resulting savings regarding site labor, material waste, and clean-up fees, and shorter construction timeframes offset much, if not all, of the cost of the panels. Structural Insulated Panels may cost more than other panels due to the insulation component, but again that cost is largely offset when compared to adding the insulation on site. In fact, SIP walls typically carry a much higher insulation factor that would require additional expense to bring a conventionally framed home up to the same energy efficiency of an SIP home. 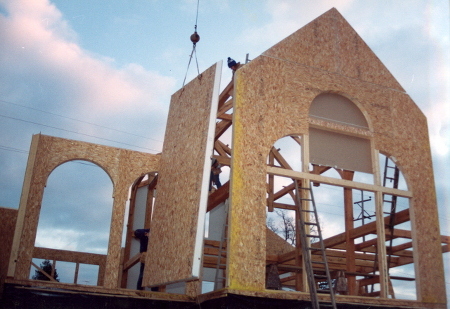 While faster to assemble than frame construction, SIPs are initially more expensive and customized details add to the cost. Panel construction is less flexible than frame type, and on-site changes are harder to manage. Electrical and plumbing work may not be easily integrated with the panels, and ventilation systems need to be carefully incorporated. Warranties for materials may not be available if the manufacturer isn’t familiar with panelized construction. Building codes don’t yet contain prescriptive language for SIPs.